Among the most well-known and best-loved of wild mushrooms, chanterelles figure prominently in the wild mushroom seasonal cycle, usually starting up in late spring or early summer, just as the season for fresh morels begins to wind down. After that, chanterelles can be depended upon to be be growing in some part of the continent for the next 6 to 8 months, and frequently longer. 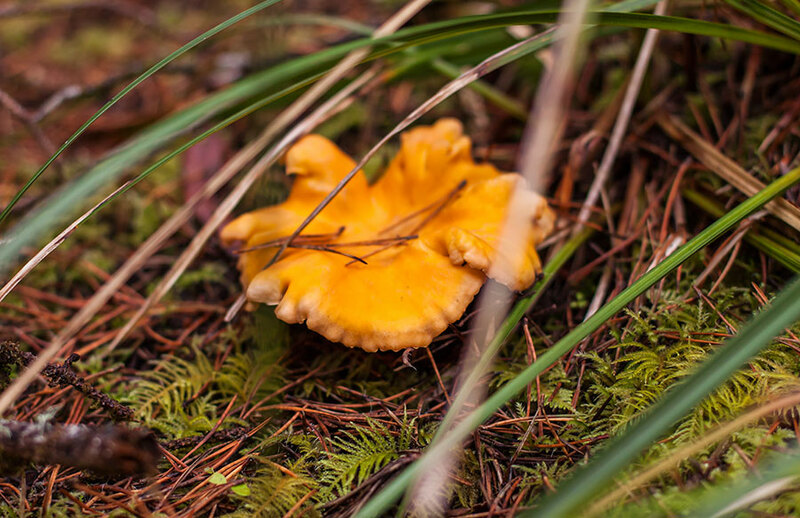 Their cheerful orange-yellow color and distinctive trumpet-like shape make chanterelles one of the most easily identifiable of North American wild mushrooms. It’s not surprising that chanterelles are so popular with novice foragers who may not recognize any other mushrooms by sight. But chanterelles are not just another pretty face in the crowd; the real reason for their appeal is their deliciously fruity fragrance, pleasing texture and, of course, their unforgettable flavor. The flavor of chanterelles is often compared to that of fresh apricots, and they are, in fact, wonderful together. A brief turn on the grill, just enough to caramelize the apricots slightly, is all it takes to subtly enhance the piquancy of the fruit. 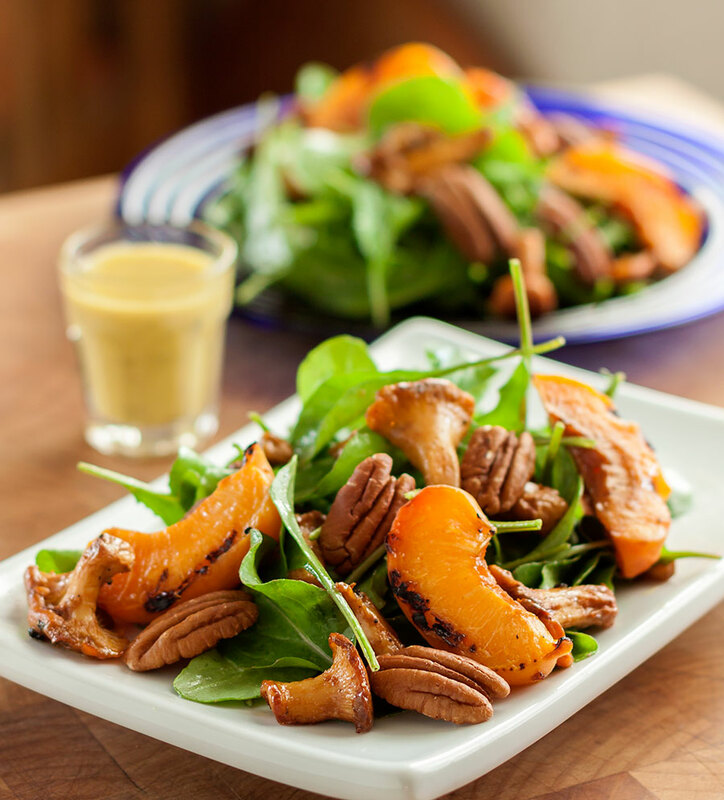 The other ingredients in this simple salad highlight, but never overshadow the chanterelle’s other qualities. The natural sweetness of pure maple syrup, the spicy bite of baby arugula and the warm, nuttiness of toasted pecans all join together to celebrate the reign of the queen of the forest, the noble chanterelle. A little pure maple syrup heightens and enhances the naturally sweet, fruity aroma and flavor of fresh chanterelles. 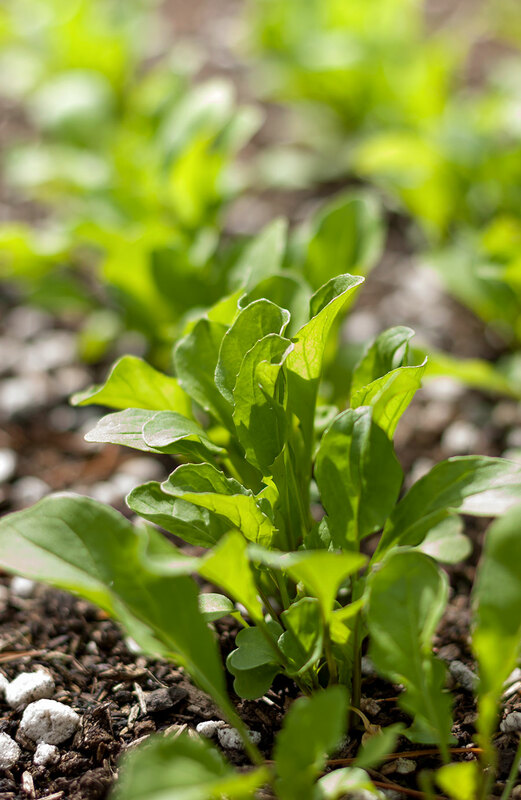 This simple, yet elegant salad is visually appealing and tastes like a rare gourmet treat, yet is very easy to prepare. Pre-heat the oven to 350 degrees F. Spread the pecans on a baking sheet and toast in the oven for 6 -7 minutes or until fragrant, turning them halfway through. Remove from the oven immediately to avoid scorching. Rinse the chanterelles briefly under cold running water to remove any grit. Drain well and pat dry with a clean kitchen towel. Slice any large chanterelles into halves or quarters lengthwise; leave smaller chanterelles (1 inch diameter and under) whole. Heat the olive oil to medium-high in a large saute pan. Add the mushrooms and sauté, stirring, until they soften and any liquid has reduced, about 6 – 8 minutes. Add the maple syrup, tossing to coat well. Sprinkle with a little salt and a few twists of fresh black pepper. Cook for another 2 -3 minutes or until nearly all of the liquid has evaporated and the mushrooms are nicely glazed with the thickened syrup. Remove from the heat and set aside. Preheat a grill (or grill pan) to medium high. Oil the grate well to prevent sticking. Rinse the apricots and pat dry. Slice into quarters or eighths, depending on size. Put the apricot slices on skewers and brush lightly with olive oil. Place the skewered apricots on the grill and cook for 1 – 2 minutes per side, turning once – just enough to caramelize them a bit, but not enough to cook them through. Slide the grilled slices onto a plate. 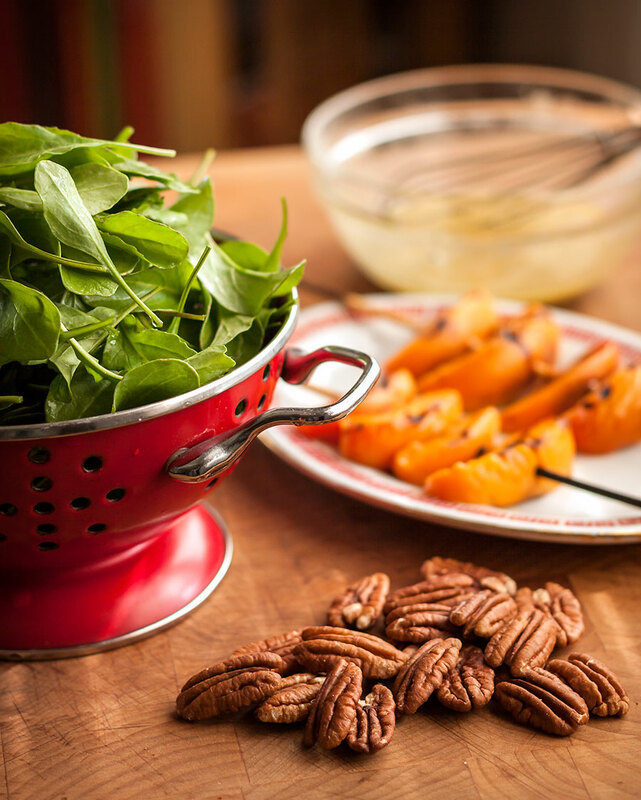 Toss the arugula with a little of the dressing and divide between serving plates. 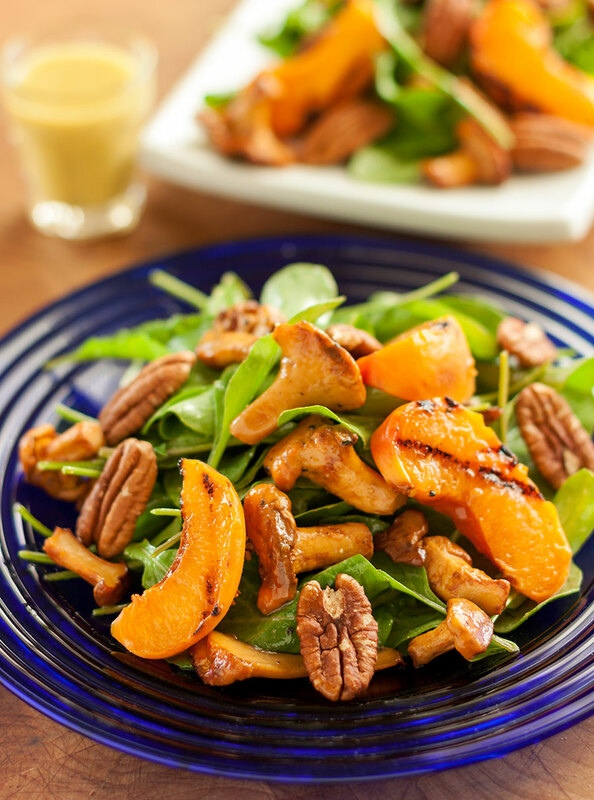 Top with the glazed chanterelles, pecans and grilled apricot slices. Drizzle with a little more of the vinaigrette and serve with a grind or two of black pepper. Whisk together olive oil, cider vinegar, maple syrup, and Dijon mustard until emulsified and thick. Season dressing with a pinch of salt and a few grinds of pepper.